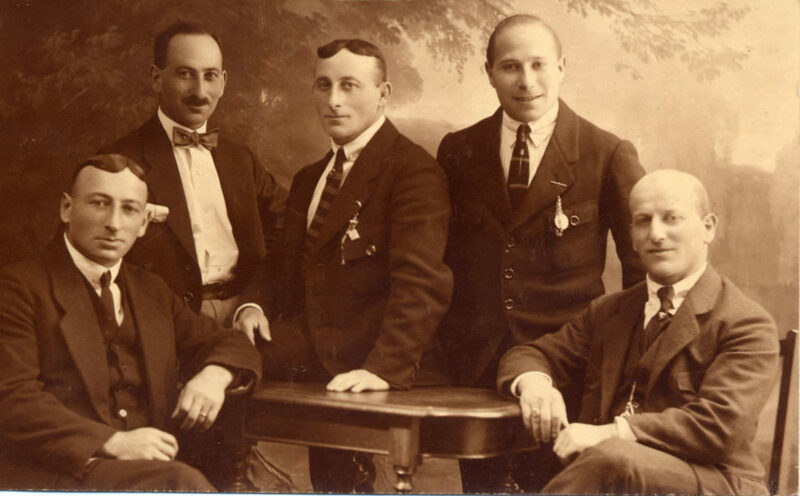 The brothers Arthur and Rudolf Lorch came from a traditional German-Jewish circus family, which resided in the Southern Hessian town Eschollbrücken. Together with their eldest brother Julius, they formed the core of the world-famous Risley act troupe “Lorch Family”, which had been founded by their father Louis Lorch and in which their further siblings worked at times, too. 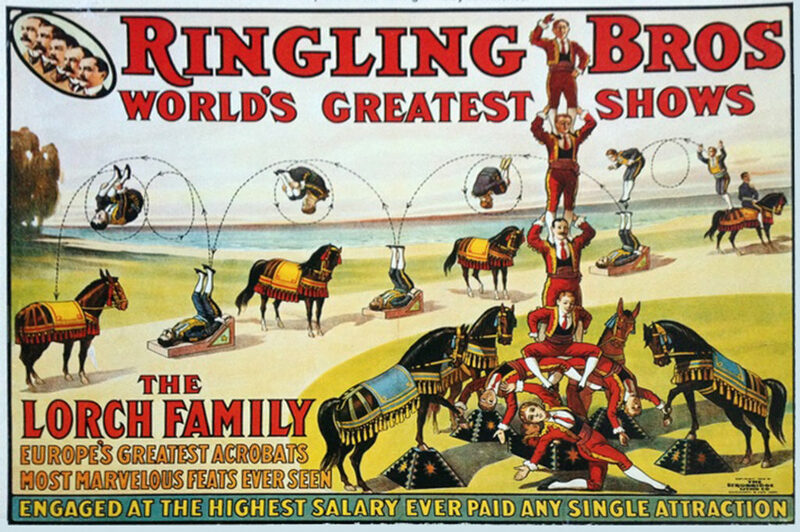 Besides the regular tours through Germany and Western Europe, the “Lorch Family” travelled with the Ringling Brothers through the USA between 1909 and 1912 and attended the Circus Sarrasani on its tour through South America from 1923 to 1925. Julius, Arthur, and Rudolf founded their own travelling circus “Gebrüder Lorch” in 1927, but only three years later, they fell victim to the Great Depression. After this bankruptcy, they returned to their initial performance style. Nazi stage bans for Jewish artists forced the three brothers to leave Germany in October 1933, while Julius’ wife Sessie (1875-1943) and Rudolf’s non-Jewish wife Liddy (1897-1979) stayed in Eschollbrücken. Together with their sister Jeanette, the Lorch brothers moved to Belgium, from where they toured through Western European countries in the following years. The emigration to England, where their brother Arthur (1887-1939) had been living already for several years, was not possible, since the British authorities granted only six-week visa to the acrobatic troupe. In 1938, Julius’ diabetic leg had to be amputated. From then on, Jeanette looked after him, while Arthur and Rudolf earned the family’s livelihood. When the Wehrmacht attacked the neutral Belgium on 10 May 1940, the Belgian police arrested thousands of German men of military age as “enemy aliens” and deported them in agreement with the French government to the internment camp Saint-Cyprien in Southern France. Arthur and Rudolf Lorch belonged to the group of arrested Germans. As Jewish internees, they remained confined even after the French capitulation and went through various camps in Vichy France. In their letters to Jeanette and Julius in Brussels, they described the living conditions in Saint-Cyprien and Gurs as most agonizing, while the situation in Noé, Saint-Gaudens, and Vernet was much better. Thanks to their wide circus network, the interned brothers received not only the common donations of the international aid organisations, but also food packages and money transfers from private persons. Due to the malnutrition in the camps, Arthur and Rudolf nevertheless quickly emaciated and lost some of their teeth. When Rudolf developed a diabetic foot syndrome, the French camp administration transferred him to Saint-Gaudens, where a doctor had to amputate several toes in May 1942. Soon after his surgery, Rudolf learned from a letter of Jeanette that his brother Julius had passed away in Brussels. Moreover, he would never see his brother Arthur again, who was deported from Noé to Auschwitz in August 1942. The same applied to Rudolf’s sister-in-law Sessie and his further brother Eugen (1885-1943) in Eschollbrücken, who ended up in Auschwitz in March 1943. In one of his last letters of April 1944, Rudolf Lorch wrote about his fear that he and his fellow internees could “suffer the same fate as Arthur”. Only a month later, indeed, followed Rudolf’s deportation from Vernet via Drancy to Auschwitz, where his trace is lost. Jeanette Lorch, who had preserved the letters of her deceased brothers Arthur and Rudolf, returned to her parents’ house in Eschollbrücken after the war.